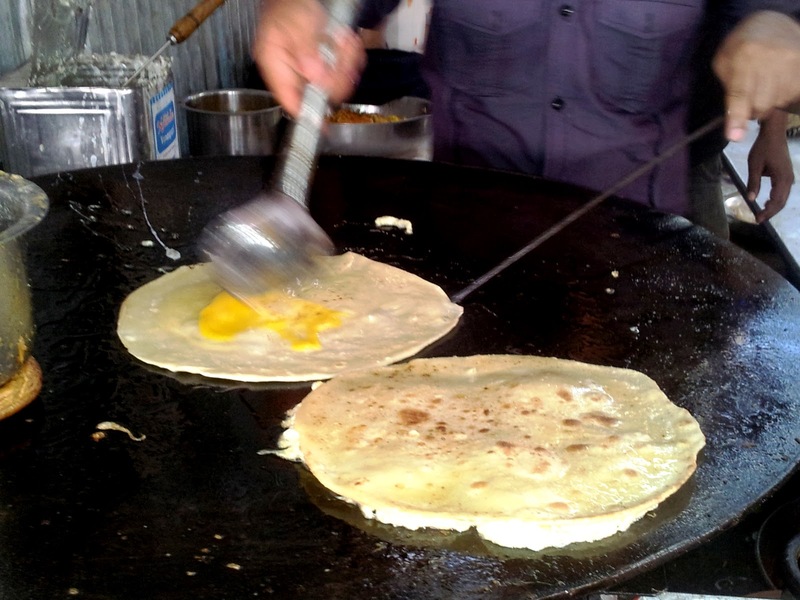 Before the advent of savvy advertising, and before the hospitality boom arrived, the original food festivals , were actually the Indian festivals themselves. The absolute disregard for all diets and health restrictions, with a joyous uninhibited serving of delicious food and equally unabashed gorging on delectable sweets and foods, is what makes Indian festivals some of the happiest moments of our lives, and the best parts of our childhood. 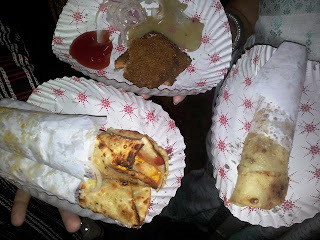 Durga Puja for me is by far the most foodilicious festival of all festivals. 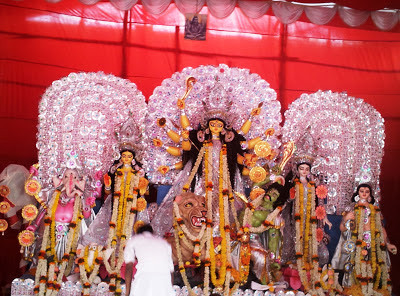 Durga Puja, which coincides with navrartri is celebrated in many parts of the country. There are many stories which speak of the significance of Durga Puja, but my favourite story is that Goddess “Durga” has come home to her parents home along with her four children, ‘Saraswati, Lakshmi, Karthik, and Ganesh’. She leaves her husband , Lord Shivas abode in mount Kailash and shall return at the end of 10 days , also called ‘vijaya dashami’ as it coincides with the day that Lord Ram killed Ravana. Ma Durga in the centre, flanked by her two daughters Saraswati Goddess of knowledge ,and Lakshmi Goddess of wealth, and her two sons Lord Ganesh God of prosperity and auspicious beginnings and Lord karthik God of beauty. A picture of Lord Shiva looks down benignly from above the idols. This story made a lot of sense to me as a child, first there were the idols of Durga with her 4 children, also homecoming is a moment of joy and so was Durga Puja for us, Third and most important was the great food. It’s a common fact that whenever we return home whether it be from boarding schools or hostels, or from in-laws place, we are pampered and fed our most favourite food items. 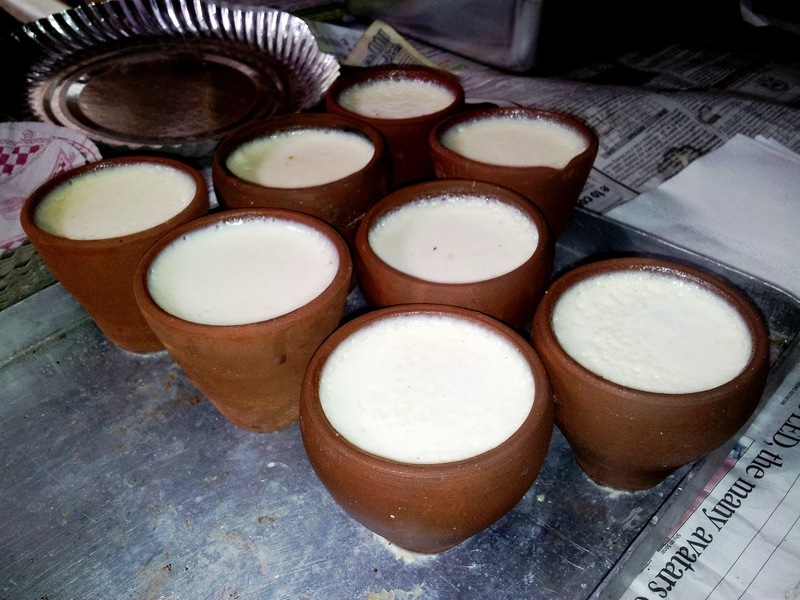 Thus, it made complete sense to me that some of the most amazing food items would be featured during Durga Puja or the coming home of the Gods. 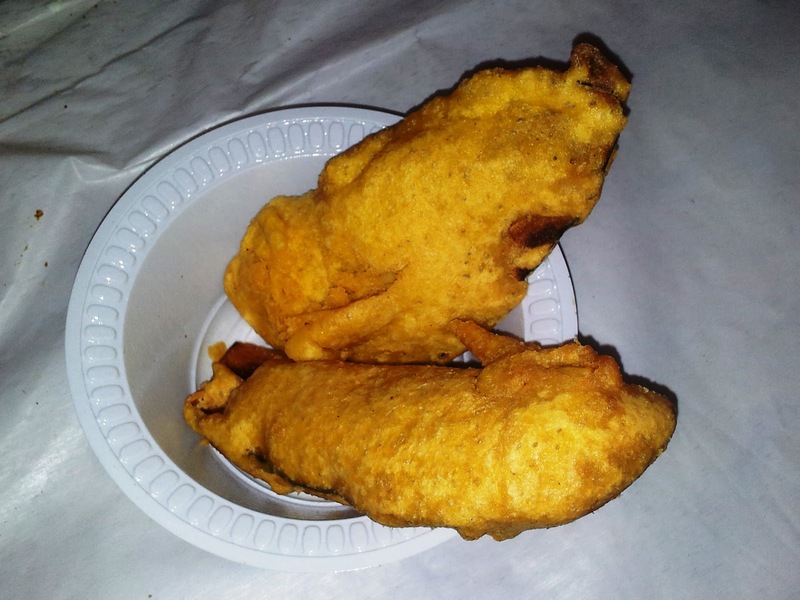 which indian festival can you expect to be having crab claws with mustard sauce? Durga puja is all about happy moments, get togethers with families, new clothes, street food,ice creams, and sweets and all the forbidden pleasures much like a visit to grandparents place. Even though navratri is for 9 days, Durga Puja essentially starts on shoshti or the sixth day. A day when the pandals generally have home made Bengali delicacies, cooked by the ladies of the community. 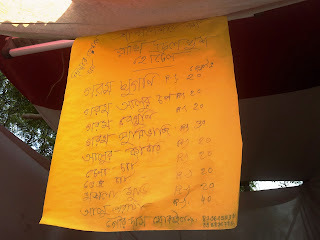 As a probashi Bengali, “non-resident Bengali” it is a treat to find a mini Bengal in different parts of the city. 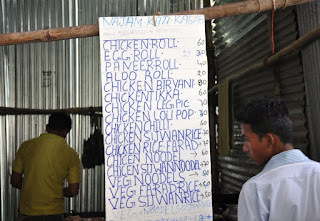 Ladies from neighbouring homes proudly serve home-made fish curry rice, or chicken chop, or some home made biryani. Yes non veg is served in the pandals, unlike any other God fearing Hindu traditions. 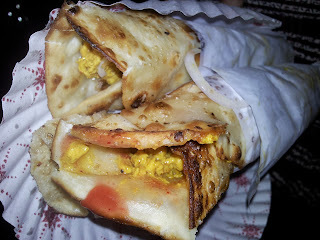 mughlai paratha, with the pink onions, and crab claws with mustard sauce. I guess its because it’s a homecoming of Gods. If you are coming home after many days, infact only once a year, it kind of makes sense that the choicest foods be served, and non-vegetarian is no exception. The variety of food is mind boggling. 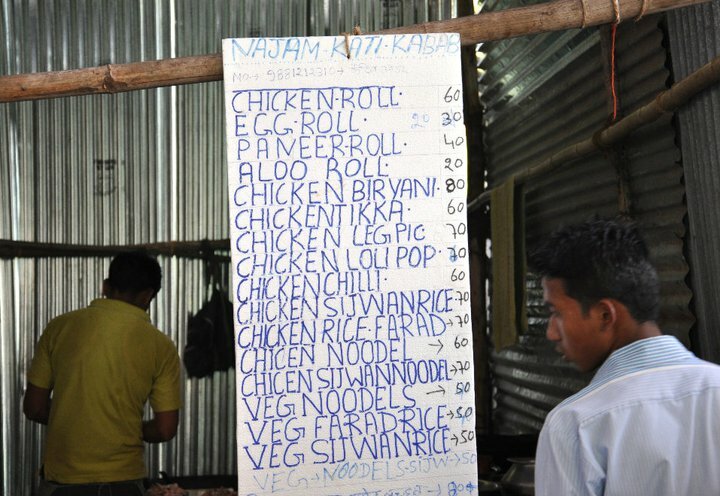 The stalls serve everything from ‘chineeez chowmeen’ to ‘crab claws’. If I had to name the top 5 dishes you must have at your next rendexvouz with the Gods on Durga Puja it would be- “chicken roll (vegetarians can have potato, paneer,or egg roll)” “mughlai paratha” “kosha mangsho with luchi” “fish fry with mustard sauce” “beguni”. 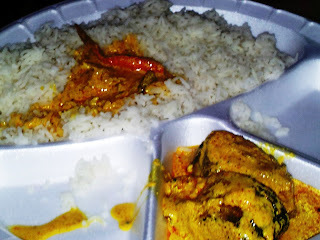 ilish fish and rice. the best fish in all the waters. 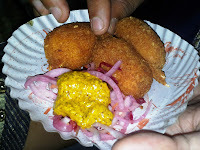 A roll, is a flat bread made of refined wheat ‘maida’which is then coated on one side with beaten egg, and rolled with a stuffing of choice, along with pink coloured onions, chilly sauce,and mustard sauce.It is the Bengali version hot dog. 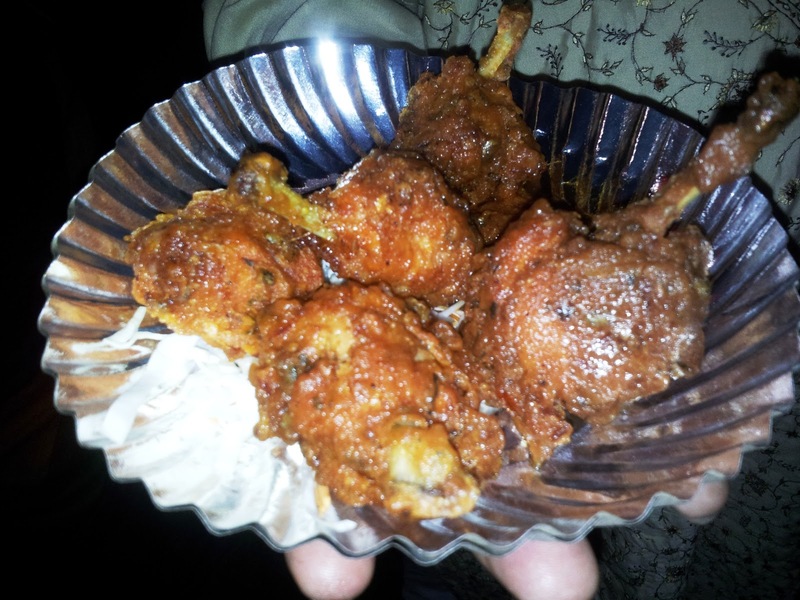 Infact I am not sur if it is even Bengali, infact as children we were pretty sure that chicken lollipops and momos were Bengali dishes, just because they were ubiquitous at Puja pandals. Mughlai paratha , is a stuffed bread,stuffed with egg and minced chicken. 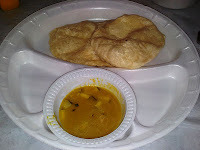 Kosha mangsho is extremely tender mutton in a thick spicy gravy, best had with puris made of ‘maida’. Thin slivers of fish marinated in green paste and covered in bread crumbs are deep fried for our culinary delight.all these food items are converted in true blue Bengali street food with a side serving of pink coloured onions, an orange colouredchilly sauce and a yellow mustard sauce. Cholar dal with pieces of coconut and fritters of brinjal deep fried in batter are perhaps a few of the vegetarian dishes. 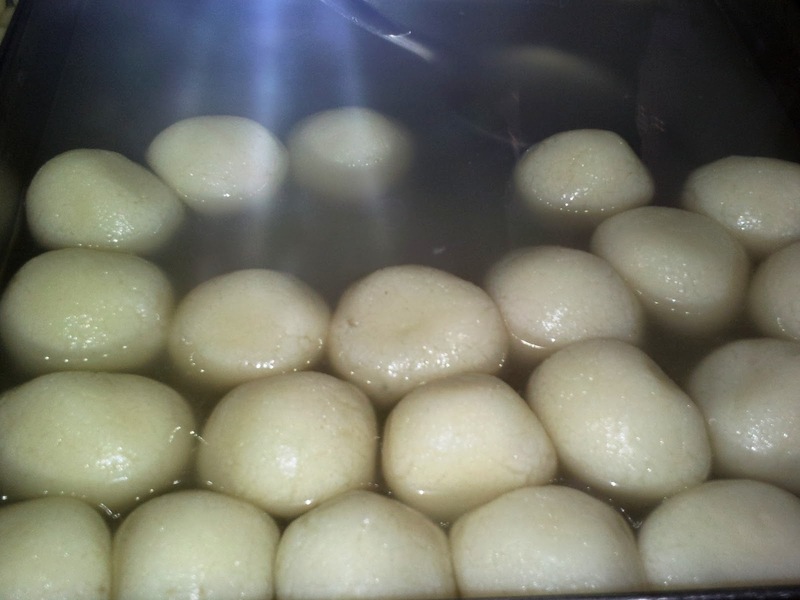 Pani puri or phuchka is an all time favourite, especially the spicy water it is served with. 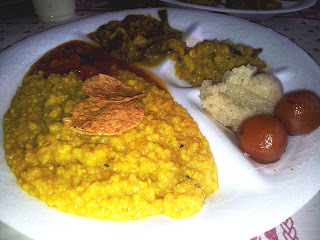 Bhog, with the quintessential khichdi, a tomato chatni,a mixed vegetable sabji and sweets.served with pickle, salt and papad.previously on plates made of dried leaves, now in disposable plates. 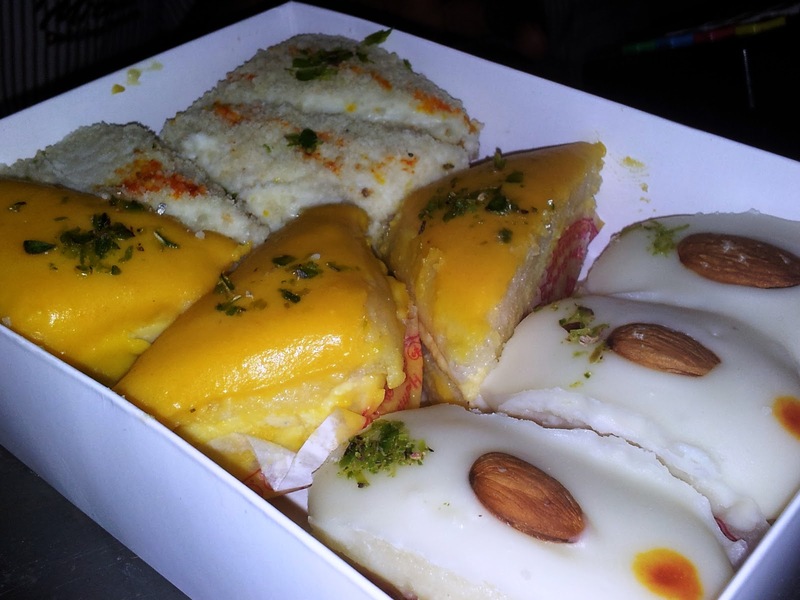 No durga puja can be deemed complete without bhog. Bhog is always completely vegetarian, and yet it satiates at all levels. Bhog is served for lunch every day of Durga puja, and since Durga puja is generally Sarvajanik, anyone can partake of the meal. People stand in serpentine queues and are served by young and enthusiastic men of the Bengali community. 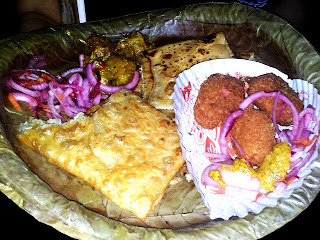 They pour khichudi, and urge an extra papad, and serve you laddles of mixed veg ‘labda’ and sweet tomato chatni. 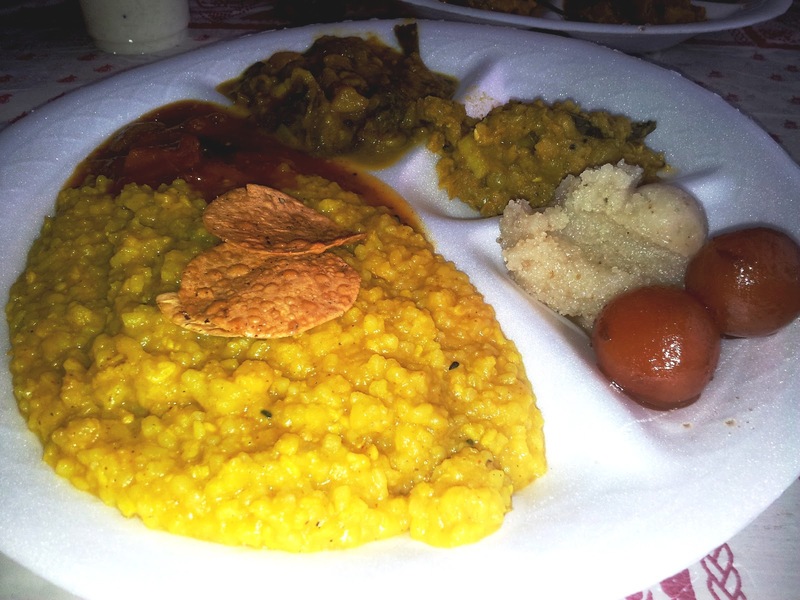 Khichdi made in the large communal kitchens of the puja pandals is inimitable at home. Maybe it is the fact that large quantities of food are cut and cooked and served and eaten in such a harmonious way that it is not just oneness with God, but also oneness with our fellow human beings that one feels. Vijaya dashami, the last day of Durga Puja is also the day when we bid adieu to Ma Durga and her children as they return to their heavenly abode. I have often wondered if they came down to earth just to sample our food. 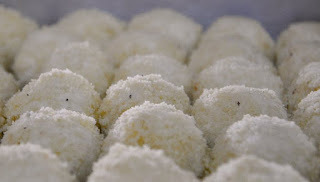 This is also the day we wish each other ‘Bijoya’ and give sweets to people at work and our neighbours. Kheer kadam, sandesh, rasagullas, and malai chamchams, remind us that we must wait an entire year for the festivities to return. Aashche bochhor aabar hobe. 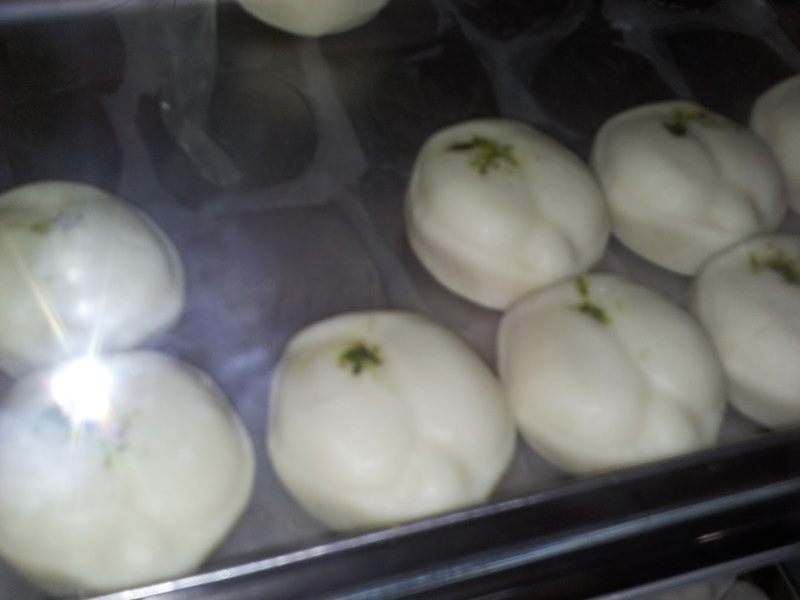 the indian ferraro rochers, kheer kadam.